Lantern in hand, Elandine walked the Path of the Dead under the light of the Seven Moons. Their cold radiance splintered on the raised road that wound for miles through the queendom. Crypts honeycombed the rampart beneath their feet. In those metal-clad and lightless cavities, the dead of Hazurrium were interred, from the lowliest beggars to royalty. 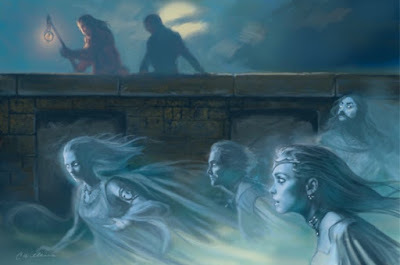 According to tales told over campfires, the souls of the dead sometimes ventured up from the Night Vault to walk the Path of the Dead, looking for their loved ones to bid them goodbye. “You won’t find her, Your Highness,” murmured Navar, who followed a few paces after the queen. “I know,” the queen replied, her voice almost too soft to hear. ~text from Myth of the Maker, a novel of The Strange ~art by Cathy Wilkins.